It has been a long and bumpy road for fans of the King's Quest series. 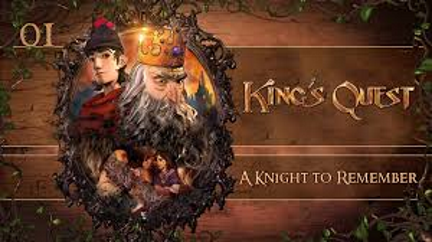 The eighth official King's Quest game has been known to have been in development at five different studios over the span of more than a decade. Each time, the game was cancelled before it ever had the chance to ever enter full development. Fans need wait no longer, as The Odd Gentlemen has finally brought the series back in the first official official King's Quest game in seventeen years. Luckily, it manages to be worth the wait. It delivers both a worthwhile sequel to the series, while simultaneously working as a reboot, both in story and game play. After it was announced that Telltale lost the license to make a King's Quest game due to Activision having plans to publish one themselves, it seemed like the next game might go the route of modern Telltale games. The announcement came in 2013, after Telltale had a run away success with The Walking Dead, so that seems to be a market that Activision would want to tap into. The result is a little bit Telltale, a little bit classic Sierra, and a whole lot of fun. The humor in this was said to be inspired by The Princess Bride, and there's definitely a lot of that, as well as other irreverent comedy such as Monty Python. It actually takes the Telltale formula to the perfect level in my opinion, mixing in the right amount of quick time events and action sequences with classic adventure game puzzles and choices and consequences. That being said, further episodes will be the true test of how the consequences play out in the season to see if it reaches the levels of games like Dreamfall Chapters. The choices and consequences are brought to light as old King Graham, voiced perfectly by Christopher Lloyd, mentions that his younger self had a choice between several options, each of which would have consequences. The quick time events are sparse in this game, as they are relegated to things such as pushing a button rapidly to chop down a tree or row a raft, rather than just arbitrary things like summing up strength. The amount of button pressing repetition is never excessive, and the quick time events mostly only take place in the first part of the game. Once Graham begins his quest to become a knight, the game is mostly a classic inventory based puzzle adventure game. There are a few areas with quick time event action after this, but they aren't as commonplace as they were earlier in the game. The game also has first person shooting sections, with a bow and arrow, that are handled really well. Sometimes these shooting sections even happen in the heat of the action, which adds to the tension in my opinion. The inventory and puzzles makes up the majority of the episode, and the puzzles are not the type where the solution is right next to the object, either. The areas to explore are rather large, and the solution might be location far away from the problem, which bridges classic Sierra with the modern adventure game formula together excellently. The game is double the current usual five dollar price of episodic adventure games, but it's also about twice the length of a usual episodic adventure. Completing the episode will take approximately four to six hours, depending on how long it takes to solve the puzzles in the game. King's Quest ends up being the type of game that should both please most fans of Sierra's classic adventure games as well as changing things up enough to bring new gamers to the series. The story is exactly what I was hoping, as it's clearly both a sequel, as well as a prequel in parts, and a re-imagining. The set up of old King Graham telling his granddaughter stories of his life works well for the game, as it gets to tell new stories never told before. For the stories that it does revisit, such as Graham's quest to get the magic mirror from the dragon, any changes to the story can be chalked up to Graham embellishing a bit to keep his granddaughter excited. The presentation is spectacular. In addition to the excellent casting choice of Christopher Lloyd as King Graham, the supporting cast members are excellent as well. King Graham's granddaughter is voiced supurbly, as are the eclectic people that Graham meets in Daventry. The voice of the short knight in particular is wonderful, thanks to the inspired casting choice of Wallace Shawn. The Princess Bride style humor is certainly helped by having his presence in the game. The art style is wonderful as well. It takes a bit of getting used to, especially in the characters, as, along with the shift in tone in regards to the humor, the art style for the series is a huge departure from the most games in the series. It goes for a more cartoonish style, having more exaggerated movements and depictions than even King's Quest VII. However, since this style works with the silly humor of the game, after a while even fans of King's Quest should find themselves immersed in the world. The music certainly helps as well. King's Quest has always had a great soundtrack, that helps set the medieval themed fantasy world of the game quite well. This game is no exception, really helping with this entry's more cinematic style of presentation. The first episode of King's Quest managed to deliver on it's premise well. It feels both like a sequel and a re-imagining, both in story telling and gameplay. The premise of having old King Graham tell his granddaughter stories of his past adventures works well for a choice based adventure game. Quick time events are present, but they aren't overused. After the prologue, most of the game play consists of classic inventory based puzzles. The puzzles are fun, and offer a bit of a challenge. The voice work is supurb, the music is top notch, and the humor never falls flat. It's a huge change in tone, both in humor, and in art style, which is overly cartoonish, even more so than The Princeless Bride. However, the tone change works well for the series, and the art style compliments the humor excellently. This episode manages to set a grand return for King Graham and his family. Hopefully the upcoming episodes manage to meet the high standards set by The Odd Gentlemen's King's Quest premiere. If it does, this could potentially end up being one of the best entries in the entire series.